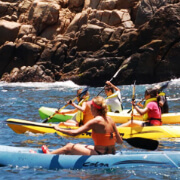 Located on the edge of Banderas Bay, this grouping of three islands is a splendid federally-protected marine reserve. Situated on the border where the placid waters of Bahia de Banderas meets the Pacific Ocean, Tres Marietas is one of the best snorkeling and scuba diving destinations in the Puerto Vallarta region. This site is home to some remarkable underwater topography, formed millions of years ago by volcanic activity. This dive spot first gained world recognition when it was featured in a nature documentary by the world-renowned oceanographer, Jacques Cousteau. This award-winning underwater documentarian showed television viewers all over the planet the marvelous wonderland below the surface of the water at this amazing site. 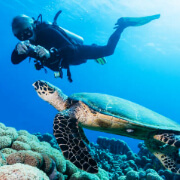 After Jacques Cousteau presented the wide assortment of exotic fish, gigantic Pacific mantas, and Olive Ridley Marine Turtles on his television program, scuba diving enthusiasts from all over the globe began flocking to Puerto Vallarta in order to explore the marvelous underwater habitat of Tres Marietas themselves. Situated only twenty 20 miles from the slips in Marina Vallarta, Las Marietas is also an excellent destination for mixed snorkeling and scuba adventures; the shallow reefs are merely 15 feet deep. 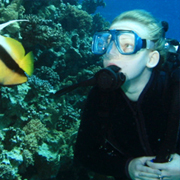 This is also a challenging dive locale for advanced divers as well since depths descend to ninety feet. One of the most interesting sights to witness at this locale is the manta cleaning station. These mammoth rays glide into the sandy bottom to be cleaned by smaller species. The impressive wing-span of these splendid animals can measure up to 14 feet. Sail onto the beautiful waters of Banderas Bay on our 60-foot sailboat, the Isis. Venture out to the one-of-a-kind Marietas Islands aquatic preserve for some fantastic snorkeling in crystalline waters over a teeming marine environment full of colorful species.